I am sure if you watched Super Bowl last night you didn’t miss the Denny’s commercials. 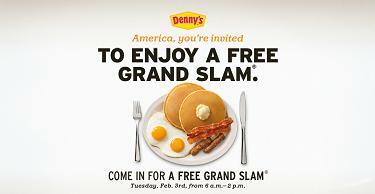 In case you are not much of a sports fan (like myself) and missed it, the restaurant chain is offering a free Grand Slam breakfast tomorrow, February 3, from 6am till 2pm to everyone who shows up (and of course while supplies last :-) ). The meal includes two pancakes, two eggs, two links of sausage and two strips of bacon. You can find a Denny’s restaurant near you using this link. 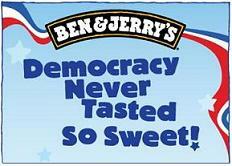 Ben & Jerry’s wants to celebrate democracy by giving you a FREE scoop of ice cream. Come to participating scoop shops on November 4th from 5-8pm, and you’ll get a free scoop of ice cream. Krispy Kreme will celebrate National Election Day by offering all retail customers with an “I Voted” sticker a free STAR shaped doughnut with patriotic sprinkles. On Election Day this November 4, any customer of legal voting age who shows up with an official “I Voted Today” sticker will receive a Free “Vote America Meal” from Shane’s! The free “Vote America Meal” consists of Shane’s hand-breaded chicken tenders (a three-piece meal), fries and a 20 oz drink. A couple more places are Eat ‘n Park who gives free coffee to any voter who presents a voting stub or “I Voted” sticker and Daily Grill who as some readers report is giving away a free Appetizer w/ Ballot Stub or “I Voted” Sticker. Do you know of other places celebrating the democracy with free food? Post them in the comments! It will be true to say that folks at Restaurant.com are working hard to bring the pleasure of dining to everyone at discount prices. You can usually buy a $25 certificate for as low as $10 and use it at participating restaurants. Now through October 31, 2007 you can get an additional 70% discount when you enter TREATS at checkout. This is all about marketing. 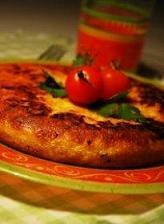 Most likely you will not find popular restaurant chains in the list. Restaurant.com strikes deals with smaller businesses and basically brings them customers by promoting these places on the internet. The result - it can be challenging to find a place you know however if you feel adventurous and don’t mind trying something new then Restaurant.com might work for you. All certificates I have tried are good for dinners only. Also, there is a minimum purchase requirement. For example, to use a $10 certificate you need to buy a dinner for the amount of $15. And don’t forget those tips as well! They have done it before and they are doing it again. Order a $25 dining certificate from Restaurant.com for as low as $10 and use APRIL discount code to take 60% off until April 30, 2007. In addition until the end of the month Restaurant.com is giving away a $10 gift certificate with each order. The free certificate code will automatically be displayed on the purchase confirmation page and will also be placed in the “My Account” section. These two promotions are stackable (can be applied simultaneously). Note however that the free $10 gift certificate is per order, so if you order two dining certificates in one order you will receive $10, not $20. If you order a $25 certificate and use both promotions, it comes to -$6, that is right, negative $6! Can you think of a reason why you shouldn’t give them a try? Let me know! How do you like a free appetizer at your local restaurant? You might not be aware but many restaurants are eager to offer you one just to get you to the door. This is called marketing. Bigger restaurant chains have in-house marketing departments, smaller ones don’t have the resources. This is when a company called FishBowl comes handy. They are the leader provider of email marketing solutions for the restaurants and according to their website offer services to over 12,000 restaurant locations. Diligent bargain hunters at SlickDeals have assembled an impressive collection of links to the sign up pages for the restaurants that offer some sort of a free gift just for signing up to their newsletter. All of these links are accessible from the restaurant websites as well however I find it more convenient to find my favorite place when they all are lined up like that. Be aware, you will start receiving promotional offers once you use any of these links. Use common sense and only sign up if you are prepared to handle the increased email traffic coming your way.